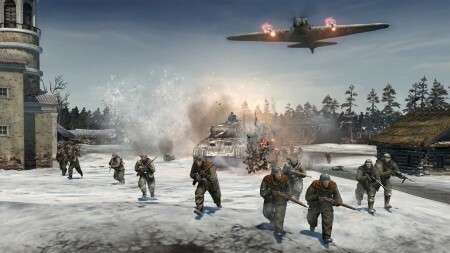 Are you eager for more Blitzkrieg 3 trailers? I sure hope you, as I have three more coming your way. I bring you two new developer diaries, with one of them talking about the secondary weapons that different units have. It will be interesting to see how that plays into the traditional rock, paper, scissors gameplay mechanics found in RTS titles. The final trailer is a pre-order advertisement, but it does show hints of what the user interface will look like. Check them all out after the break. I first talked about Wargame: Red Dragon at the tail end of February where I bemoaned the fact that the Red Dragon of the title has nothing to do with the Welsh dragon. It still gripes me, but I am somewhat appeased by news that you can pre-order the game now on Steam which will grant you exclusive access to the multiplayer beta which will kick off in the coming days. It might face some competition from Titanfall and Dark Souls II, but sometimes people need an RTS to keep them company. A Red Dragon Playing Wargames! Before you wonder, the Red Dragon of the title to this post has nothing to do with Wales, rather I am talking about Wargame Red Dragon which is the upcoming chapter in what has been a pretty massive RTS series. Red Dragon follows from European Escalation and AirLand Battle by moving the conflict into Asia with an expanded focus on naval warfare and a new dynamic campaign. Lo-and-behold, we even have the new video after the break. War is brutal and horrific, yet it feels like recent big FPS hits have failed to truly touch on the horrors of war, rather favouring over the top set-pieces and wafer thin plot. It falls then a totally different game from the Call of Duty and Battlefield’s of the world to give us a somewhat realistic viewpoint on war. That game is Company of Heroes 2 and it is a must play. Call me crazy (please do), but something about the new gameplay trailer for HARDWARE Shipbreakers reminded me of that classic FPS/RTS mash-up Battlezone. Something about not being set on Earth, the sounds of the radar and the voice overs made me think of the unique game. Back on track, after last weeks teaser trailer, this new video features some in-game footage with the UI and a little bit of action between some funky flying units and a squad of vehicles led by that massive Baserunner truck from last week. Check the video out after the break. I did want to get back into the Beta for Company of Heroes 2 last weekend, but somewhere along the line, time got away from me. Probably because I was too busy playing Mars: War Logs. Despite that setback, it is still on my list of things to play more, and this latest trailer does the game justice and does a good job of explaining why we should be prepared to play this before the next big FPS. After all the hullabaloo last week around the Xbone, it is nice to experience some sanity with a true PC game like Company of Heroes. Trailer can be found after the break. Just like with The Settlers Online, Blue Byte and Ubisoft have once again teamed up to bring us ANNO Online, a free-to-play browser based game. If you happened to have played last years The Settlers Online then you will feel at home here as the basic principles at this early beta stage are almost entirely the same. As I’ve been working through my backlog of emails this evening, I came across a message with the following title. “Homeworld Creators Release New Hardware Trailer: Look at the size of that TRUCK!” I totally ignored the majority of the title and thought “Oooooh, trucks, yay” and hastily headed over to the video linked within the message, a video you can see below the jump. It contains a truck, a monster of a truck, perhaps the biggest truck I’ve ever seen. It belongs to an upcoming RTS from some of the team behind the Homeworld games. Their new company, Blackbird Interactive is making something called HARDWARE: Shipbreakers and I am just a bit excited after watching the trailer. I’ve got so many different games I want to be playing, and yet not enough time. What I really want to be playing is Company of Heroes 2 which I somehow haven’t played for month even though the beta kicks arse. To keep myself somewhat in touch with it, I hunted down any new videos that had emerged for it over the past weeks. This one which appeared yesterday get a bit talky with two Russians talking about the war in what seems like a post-1945 interrogation. It is listed as a story trailer and also shows off a bit of action. It’s competition time at The Reticule Towers and today we have 100 Anno Online closed Beta keys to give away. Remember Age of Empires 2? It’s only the game that first introduced me and countless others to the RTS genre and defined the first few years of my PC gaming life. Well it’s back and will be exclusively available on Steam in its updated HD format. Gamescom brings out some really good things, one such thing is this batch of new screens for Company of Heroes 2. This is surely going to be one of the best RTS titles of recent years, even if you count League of Legends and DOTA as being RTS games at heart. I loved the original, and the Eastern Front setting for the new one has me giddy with excitement. Hit the jump to see all the screens, click on them to make them bigger. Earlier in the year I gave my thoughts on the newly discovered Settlers Online. Since my first impressions article The Settlers Online has had its official retail launch and has gained considerable interest from all over the world. With the new-found popularity and new direction I thought it was about time we heard some more from TSO. I managed to pose my questions regarding the new direction for The Settlers to the friendly looking chap in the picture Timo Gerken, the ‘Worldwide Active Game Manager’ for Ubisoft. Kevin – What made you want to bring The Settlers to a browser-based setting? Timo – Looking at the current changes in the video game market, The Settlers Online was a logical step to expand The Settlers universe. Ubisoft is always looking for ways to reach new customers by expanding into new territories like the online market. This includes releasing strong Ubisoft brands such as The Settlers and Silent Hunter in the free-to-play arena.